I spotted This Quilt in November and wanted to make one kind of like it. 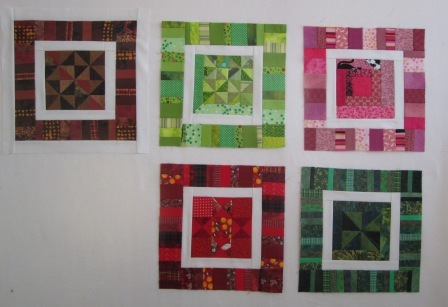 I wanted to use the scrap of scraps to make my blocks. I started the brown one in the last week of Nov and did the pink and lime early in Dec. 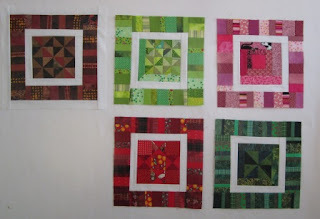 This past week I got the true red and green blocks done. 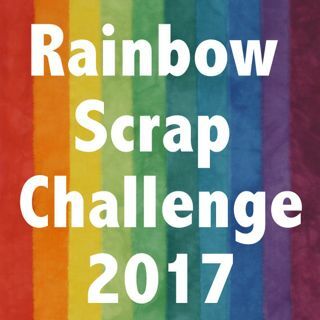 Over at Soscrappy it is Scrap Saturday were we can post a link for our scrap projects we are working on. Today is the last one for 2011 but she will be working on the challenge again in 2012. I am ahead of the game for 2012 (not behind for 2011). Check it out and join in the fun. My boxes with what I have left for Red and Green. These two piles are some of the larger piles of scraps I have. I will need to do more scrap busting to get these piles down. 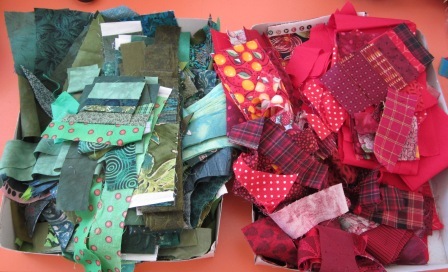 I know I have bags and boxes and piles of scraps that could be sorted, only making these boxes fuller. I need more sorting and more sewing the scraps. I have this shoe box with a pile of scraps left from the 'Bad to the Bone" quilt. I want to make a small quilt using some of these prints, as many of the fabrics do not fit in a colour family as well as others do. I was considering lots of white added in. Some are the trimmings and have great little strips cut and ready to use. 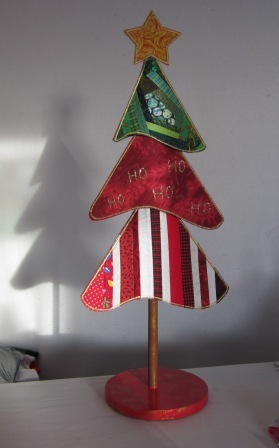 I got my scrap tree really done in time to give at Christmas. It is on the base and glued in place. Sorry for the sun light in the photo but my wall area gets sun in the morning just before I wrapped it. My sister in law looked happy to get it. I think my Mom may have been a little jealous. I may have to make her one for next year. It can be made with mostly scraps too. I think I want one too. I guess I have just commented to a few new scrap projects for the new year. I have been working on a UFO list and now I will have a list of new projects too. I really like these blocks. I need to play with this idea too, but first there is some sorting that need to be done. Have a Happy New Year! Red and green are great additions to your rainbow collection. Love the unique centers of each. Looks like you have plenty of scraps, glad you won't be running out anytime soon! All lovely pieces Cathy- and I love the tree- what did you made the tree parts from? It looks gorgeous- you have many new pieces to share. As always I love the colors you have chosen and the interesting designs you have created. WOW!!!! I LOVE LOVE LOVE the string borders on your blocks. Darn! Wish I would have seen these before making my 8" blocks today for January 2012; I could have made them 6" and mimicked your bordering idea. Your Rainbow blocks do look really pretty. 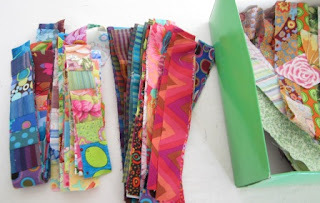 I am going to go with a similar idea and make rainbow blocks for each month too.